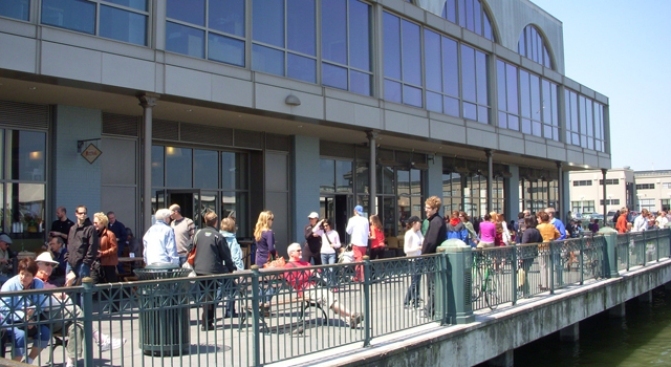 The Ferry Building's backyard will soon share space with a parking lot. We know Surfacedesign's proposal to outfit the area behind the Ferry Building with tree planters, floating gardens, and mobile kiosks was purely speculative — but it was a response to the real problem of Ferry Plaza's bleak reality. The Port's not sitting on their hands, though. In a plan to create an "exclusive pedestrian area," the Port's making the arguably counterintuitive move of bringing in 65 car parking spots for the Ferry Building's backyard. The parking spots, which would stay there for up to six years, would fund the project, which is forecast to cost $879,000. And then, after shaking hands with the devil, the Ferry Building will be able to more clearly demarcate loading and traffic areas, while stretching the current pedestrian promenade behind the building southward and making "one of the great urban places in San Francisco."